Home /News /Best poster in MCOII-2019, congratulations Christina! 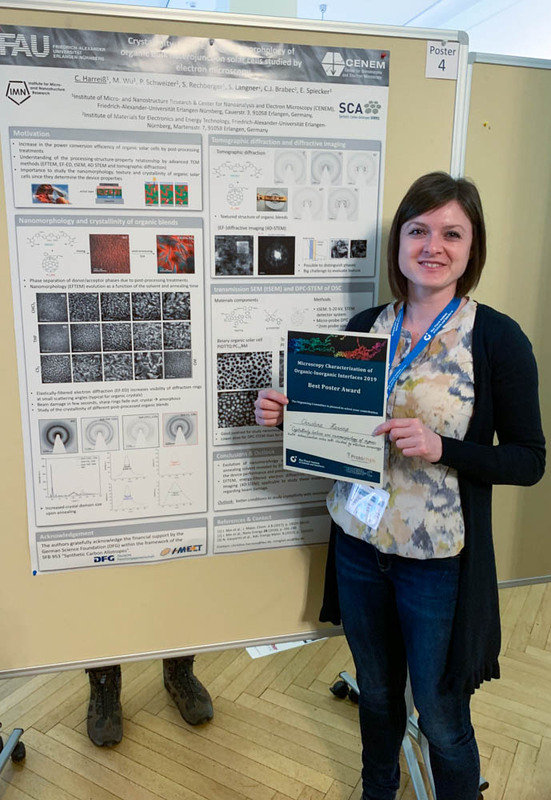 Christina Harreiss won the best poster awards out of 65 posters, during the workshop “Microscopy Characterization of Organic-Inorganic Interfaces 2019 (MCOII-2019)”, with her outstanding presentation of “Crystallinity, Texture and Nanomorphology of Oganic Bulk Heterojuction Solar Cells Studied by Electron Microscopy”. The two-day workshop was held last week between 7 and 8. Mar. 2019 at the Conference Venue of the Max-Plank-Society in Berlin, co-organized by Ernst Ruska-Centre for Microscopy and Spectroscopy with Electrons, Forschungszentrum Jülich and Max Planck Institute of Colloids and Interfaces. This meeting was dedicated to microscopy of materials comprised of both organic and inorganic constituents in close proximity and brought together leading experts both from life science and materials science communities to address this challenging and increasingly important topic. Different approaches such as the application of correlative microscopy solutions, low-voltage and cryogenic electron microscopy techniques, in situ electron microscopy and methods for fast acquisition were discussed during the meeting in the context of studying hybrid materials. Due to the inter-penetration of the focus lecture series in this year, more than 120 participants gathered in the conference venue of the Max-Plank-Society in stimulating and harmonic atmosphere. 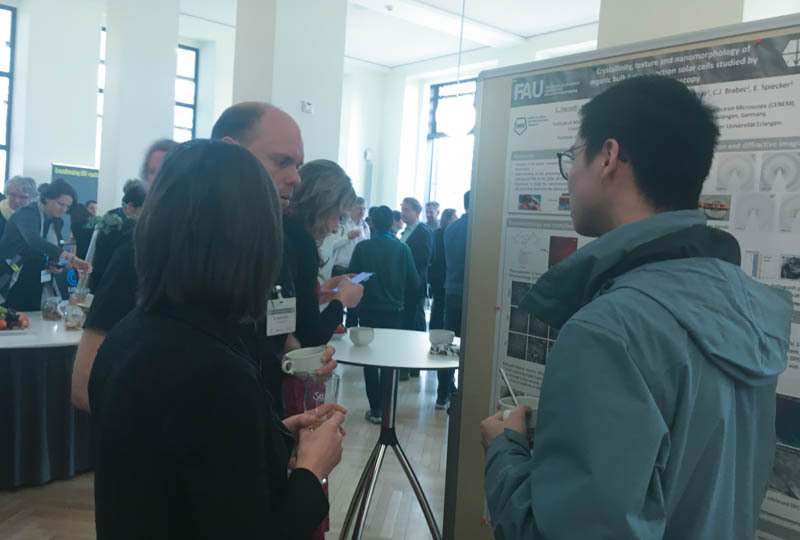 The conference offered two poster award, sponsored by Protochips, one for general poster prize and the other for in situ electron microscopy poster prize. In the poster with contributions from colleagues, Christina has presented a correlative, in situ and low voltage electron microscopy, as well as diffraction (imaging) and spectroscopy study to systematically investigate the structure of bulk heterojuction oganic solar cells and to establish and deepen the understanding of relationship between nanomorphorlogy, crystallinity, textures and interfaces and their device performance. The work has attracted lots of attention and interesting discussions. The combination of state-of-the-art methodology, application to study this beam sensitive material and outstanding results obtained have impressed the jury of the award commitee, and the award finally went to her. Congratulations, Christina! We are looking forward further contribute in this field! Photo courtesy Penghan Lu (ER-C Juelich).